Because, why NOT have two blogs? The other (and more recent one) being here. Anyway, that one’s about clothes, so I can’t post about jelly there; it would get all sticky. The other day I was enjoying the sun in Albany Quadrangle, an adorable little spot near the theater with several apple trees, and noticed that the ground was covered in unripe windfall apples . . . so I picked up almost more than I could carry and carted them all back into the library where I went looking among the stacks for books about preserving fruit. 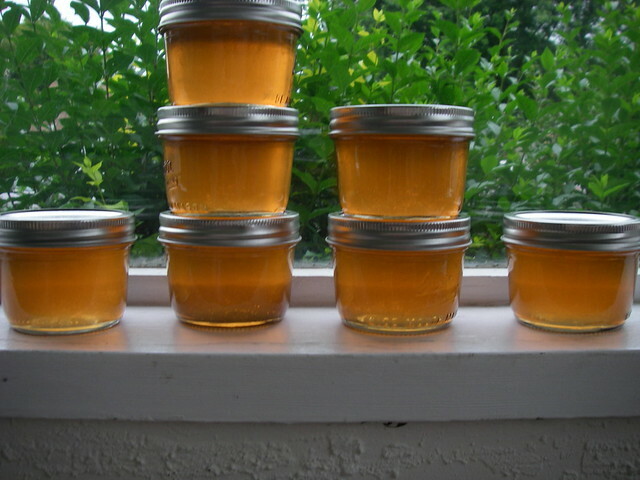 The Joy of Cooking one was the only one that seemed really useful, so I made green apple jelly! I spent about a day trying to get ALL the juice out of the apples, until I mixed it with water to make it more like juice and less like sour apple syrup, and realized that if I kept getting more juice I would run out of sugar and wouldn’t be able to use it all anyway. There is as much sugar as apple in there (1-1 ratio, crazy!) but I didn’t dare risk cutting the sugar and compromising the jelly. I stayed up really late canning and frantically reading about the jelling point while trying not to let my preserves overcook. I got to drop syrup on chilled saucers and everything! It still hasn’t set completely, but my trusty cookbook informs me it can take 1-3 weeks for jelly to finish setting, and it’s already recognizable as jelly. It’s also not the clearest jelly ever made, since I used two layers of cheesecloth instead of four (while really professional people strain it TWICE), but I think it’s pretty, and it’s the first thing I ever canned on my own! 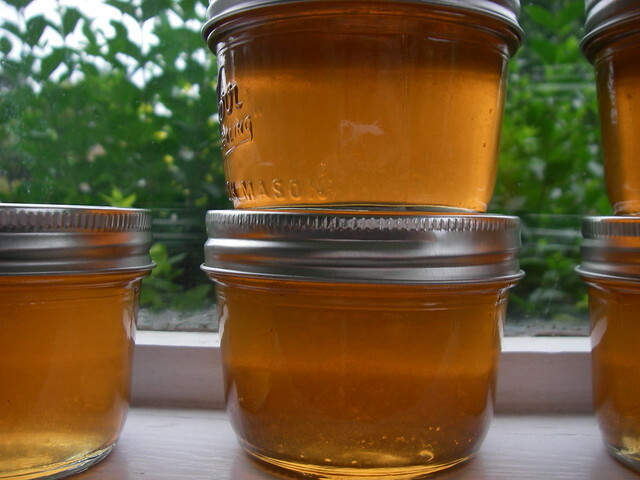 This entry was posted in food and tagged foraging, jelly on June 29, 2012 by Alice.